The Punjab government has earmarked Rs 31 billion to the energy sector, including Rs 15 billion for the RLNG-based power plant in Bhikki District in Sheikhupura. Punjab Finance Minister Dr Ayesha Ghaus Pasha said the growth strategy devised by the Punjab government had focused on the energy sector. “Following the strategy, the government has decided to play a pro-active role in the energy sector ahead. It has set up the Quaid-e-Azam solar park, one of the biggest solar power projects, in Bahawalpur last year with a capacity to generate 1,000 megawatts of electricity. The phase-I of Quaid-e-Azam Solar Park has been completed. Besides, more steps have been taken to build capacity of the energy department to attract private sector investment in the sector,” she added. She added, “Under the new initiatives and targets planned for FY 2015-16 included the completion of renewable energy development sector investment programme (hydro power generation project in Marala, Pakpattan, Chianwali, and Degout fall) for adding 20 megawatts of energy to the national grid. The government has planned to start coal-fired power projects in the public and private sector. 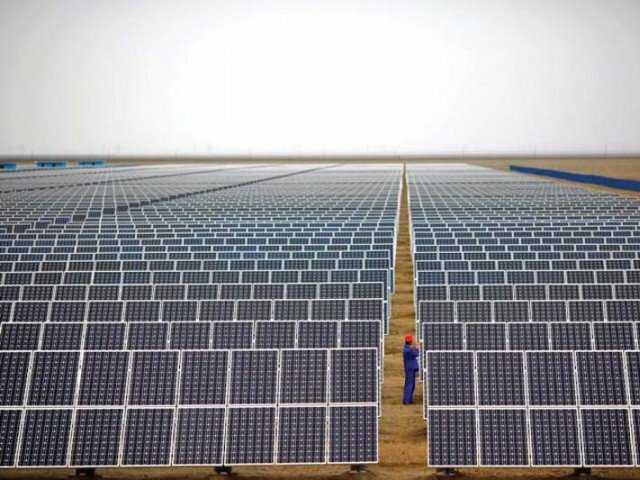 It will undertake 900-megawatt solar power projects by the private sector in the Quaid-e-Azam Solar Park Cholistan. “Beginning of LNG projects for 1200-1500 megawatt at Bhakki Sharif Sheikhupura, feasibility study on wind power project, start of bio mass power project at Faisalabad, shifting of the Planning and Development department on solar and beginning of energy efficient building in Lahore are a few more steps taken in the provincial budget. The energy is one of the most critical sectors of the economy and accordingly the government has accorded it the highest priority. The Punjab government is investing Rs 258 billion in different power projects while attracting Chinese investments of Rs 360 billion in his area. A number of coal-based power plants are under construction. Pakistan””s first solar power plant has been inaugurated in Cholistan, which has started generating 100 megawatt electricity. The Solar Park in Cholistan is now being developed to get additional 900 megawatt electricity. All these projects will be completed by the end of 2017 and will generate additional 2,600 megawatts of electricity.” She also encouraged the private sector to invest in power generation.